One of the things I really love about writing this blog is how much I learn – I just never know where a chance encounter with a plant, food or people is going to take me. Now take Amaranth – such a useful plant for the subtropical kitchen garden, incredibly underused and virtually unknown in this part of the world. I first encountered it in my Balinese kitchen garden where it was a staple crop and used by the locals in anything where ‘greens’ were needed. They call it bayam. I noticed then that it was very prolific and virtually unaffected by pests. 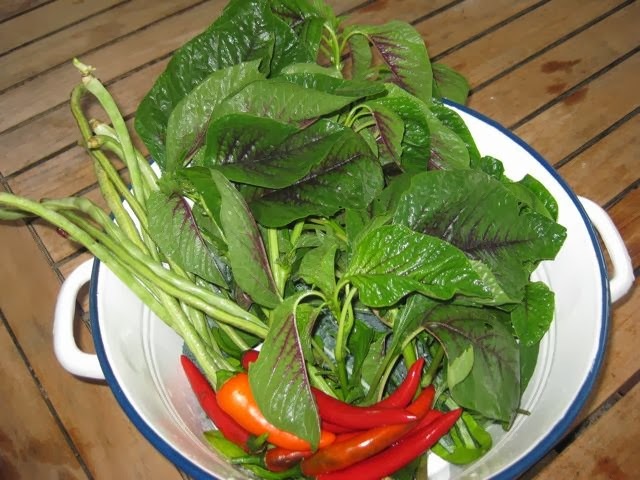 I have had the red/green leaved amaranth (‘Red Calaloo’) happily growing in my kitchen garden for the past few months surviving all the vagaries of Mullumbimby summer weather and pests. FACT: Amaranth is in the CHENOPIDACEAE family – it is not in the cabbage family (BRASSICACEAE) so does get affected by pests in that family e.g. caterpillar of the cabbage white butterfly (click here for more information). There is always a trigger that sends me up the garden path and makes me want to write a story about something. 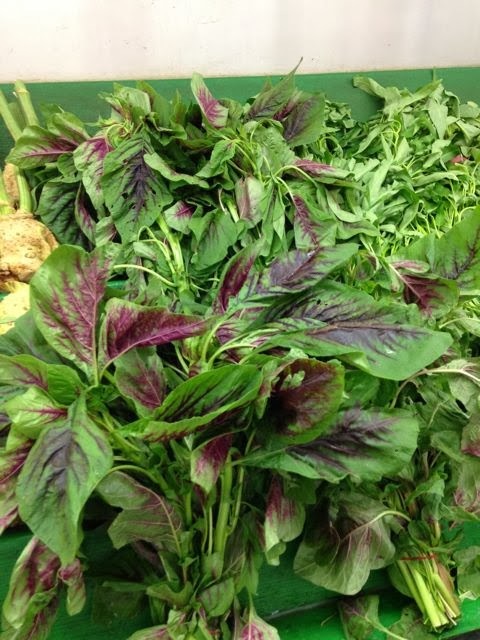 With amaranth it was seeing big, beautiful bunches of it for sale in a shopping centre in Sydney (Randwick) – something I don’t remember when I lived there – it was labelled as en choy. I asked the shop assistant who mostly bought it and he said Greek and Asian people. Then I remembered that I had also seen it for sale in Greece where it is used as a substitute spinach and part of their horta (wild greens) repertoire. 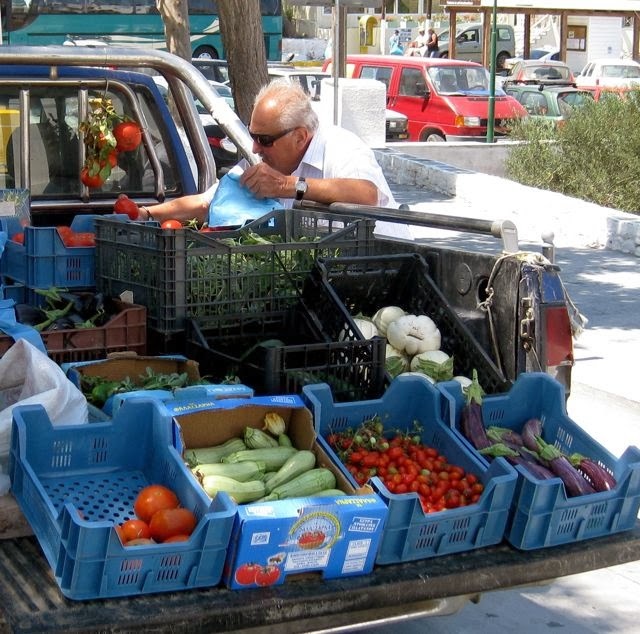 The diet of the average Greek has changed, but grasses, weeds and leafy greens have always constituted a regular part of a native Greek’s traditional daily meals. 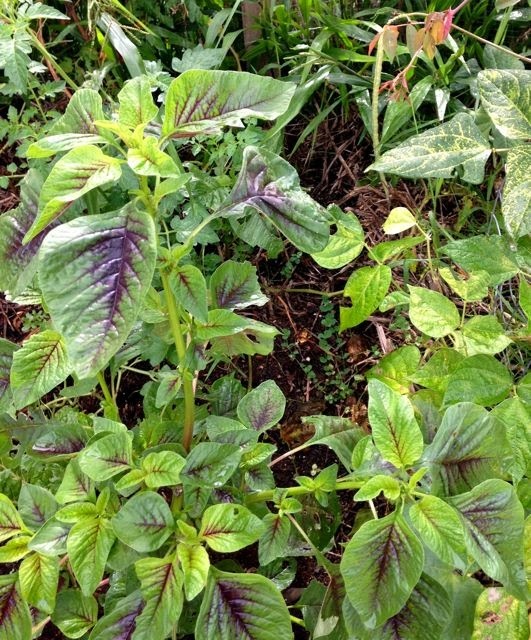 There are many different varieties of amaranth and in Greece the green leaf kind (grown under dry conditions) is known as vliti and the red/green mottled variety (which needs wetter coditions) referred to as papagalos or “parrot” – the kind I have growing in my garden and the same for sale in Sydney. 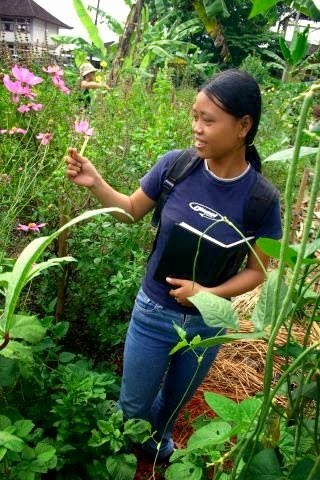 WHY SHOULD WE BE PLANTING AMARANTH? Firstly, this is a summer vegetable that survives the wet and heat of summer when just about everything else has turned up its toes. Secondly, it is extremely nutritious and versatile to cook with – think substitute for spinach. Lastly, as I have mentioned, it is largely unaffected by pests. Amaranth species are broad-leaved annuals, usually single stemmed, growing up to 2m in a season. They are grown for two main purposes; their protein-rich grain and nutritious leafy greens. Propagate readily from seed sown in spring. CULTIVATION. A very fast-growing, tough, easy-to-grow plant. Amaranth grows best in full sun and does not tolerate shade. There is a variety to suit every location, but Amaranth bicolour is best for the sub-tropics. Check with your local seed supplier to find the best one for your location. A.bicolour is not pH fussy but grows best in a lightly acid soil of 6. It is tolerant of heat and wet conditions, but not water logged soil. Grows best in soils that have been compost enriched and then mulched to prevent drying out. 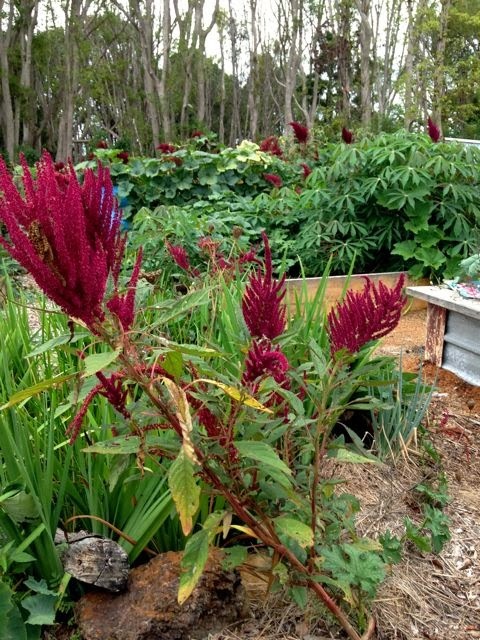 This red flowering variety of amaranth is often sold, around our way, as a food plant and while, undoubtedly, you could eat it – it is really best for feeding to the chooks. It goes to seeds very quickly and produces little in the way of edible leaves. You can’t go past the ‘Red Calaloo’ for eating. FOOD. Both Leaves, young stalk and seeds of this plant can be used. Young stalks can be lightly cooked and are asparagus like in taste. Young leaves are either lightly steamed or stir-fried, and have a mild, spinach-like flavour – the leaves are added to curries in India. In Greece leaves are used as a substitute for spinach in pies and fritters. With wild greens of any kind (horta) the traditional way to prepare them is to blanch the leaves in boiling water then toss them in olive oil, lemon juice, a little garlic and salt and pepper. I have no experience of cooking the seeds – I just know that chickens love the seeds heads and they always know what’s good for them! They are one of the most protein rich seeds so maybe that has something to do with it. The plants contain an unusual chemical called squalene (also found in shark’s liver), which is a powerful antioxidant and has been used to boost the immune system and to treat hypertension, skin problems and metabolic disorders. Plants contain betalain, which give the plant much of its red colouring. These powerful antioxidant compounds are fairly unusual in the plant world, and have significant nutritional benefits. I always look forward to coming home after being away for a while and I am always hoping that I have something in the untended garden to either make a salad or a stir-fry with. I was not disappointed – lots of lovely amaranth, snake beans, kale, capsicum and chillies. 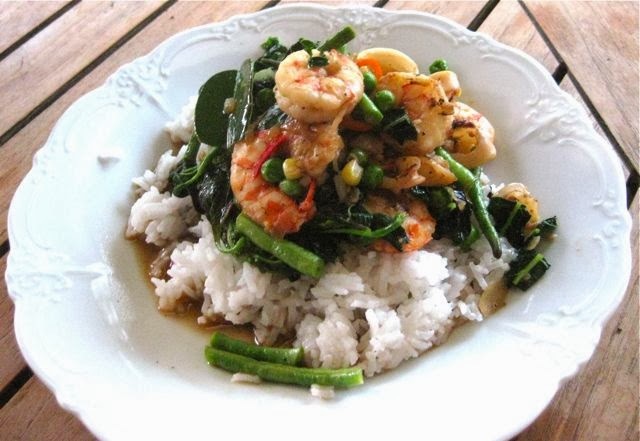 Add some Thai basil, lemon grass and kaffir lime leaves and dinner was on it’s way. Luckily my flight comes into Ballina, that has one of the few remaining seafood markets – and you just never know what the fishermen have pulled up. 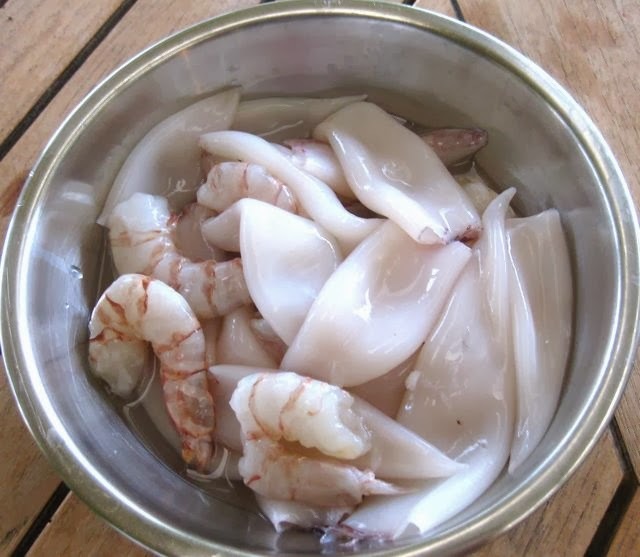 A quick detour on my way home brought up some very cheap baby squid and green prawns – I was just not that happy that cleaning them was the first job I had to do when I walked in the door! 1 bunch amaranth, roughly chopped. 1. Heat oil in wok and add onion. Stir for 1 minute. 2. Make sure wok is very hot then add seafood and toss around for another minute. 3. Add chopped vegetables, garlic, chilli, kaffir lime leaves and chopped lemon grass. Toss for 1 minute. NOTE: Stir-fry’s are very flexible dishes – which is probably why thy are so popular. You could swap the seafood for chicken and use any greens/beans/broccoli/cauliflower/snow peas/capsicum/carrots/bean sprouts/cashew nuts etc. The name Amaranth comes from the Greek amaranthos (αμάρανθος) the “un-withering,” or “fadeless” (flower). Associated since the most ancient times with the goddess of the hunt, Artemis (Diana) – I knew there had to be a reason why I was going up this particular garden path!